This week I’m taking you behind the scenes of my current published assignment for Australian Geographic. It’s only a short feature and you can see it in the November December 2016 issue called “Raptor rehab”. Here are some notes as to how and why I shot some of the pics. 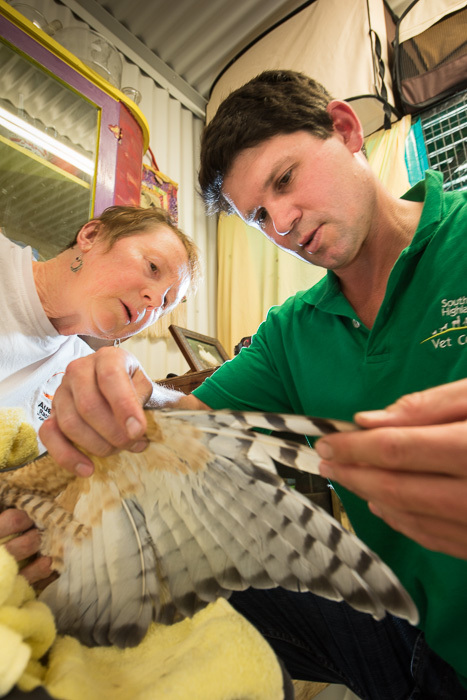 I was allowed very limited access to these injured birds of prey which were mostly in dark cages. Their caretaker didn’t want them to be exposed to humans as it might delay their rehabilitation into the wild. I was permitted about one minute in each cage. The key under such circumstances is to adjust all camera and flash settings before stepping inside. Even so, I literally only got 3-4 frames before she told me time’s up. This was so different from regular situations, whether wild or captive, where I have the luxury of time and can adjust backgrounds, compositions, lighting, etc. I hoped that I would be able to compensate later at the post production stage. But as you may be aware, true-to-life magazines like Australian Geographic frown on this. Talk about a rock and a hard place. This lovely masked owl above was having a snooze up against the green gauze lining its cage. Although I submitted the original photo to #ausgeo, for the purposes of this blog article I did a little “improvement” by blurring the background with the Photoshop Blur filter. I deliberately left it that plastic green hue to indicate this is still an “artificial” shot – not taken in the wild. 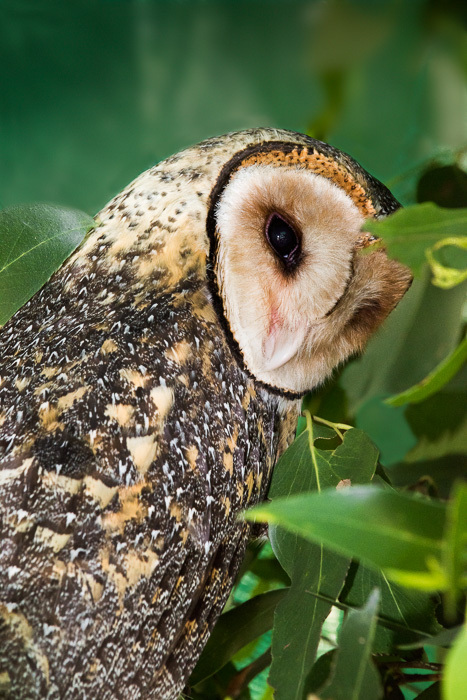 I still like it because the angle of the owl’s body and the way it turned its face towards me creates a human-bird connection. 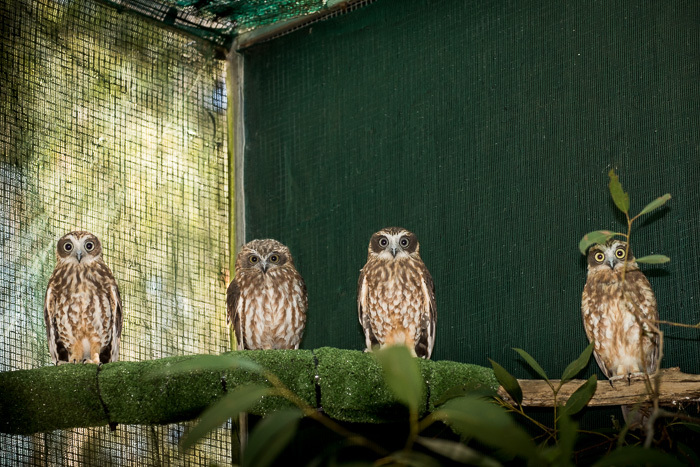 It’s the same story with these utterly cute Southern Boobook owls. The background is so bad it’s almost unpublishable – unless you’re showing how their cages are carefully prepared for their needs: perches with either soft wrapping or raw timber for their grip and scrubbed clean every day. I’ve taken lots of photos of these guys over the years – they always ‘look at you’ with a surprised expression in their eyes. So cute. 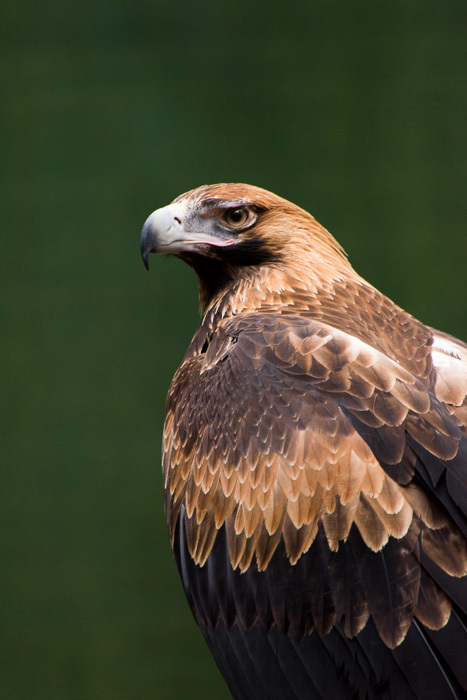 The wedge-tailed eagles were doing great in their big circular aviary. Although they couldn’t yet fly, they were well on their way to gaining back full flight control with lots of room to practice. I didn’t shoot a video of this activity so I stitched some stills together to create a sort of time lapse of one eagle practicing. Even though the story was about birds in being held in a special training aviary, I didn’t really want the cage to be too obvious. 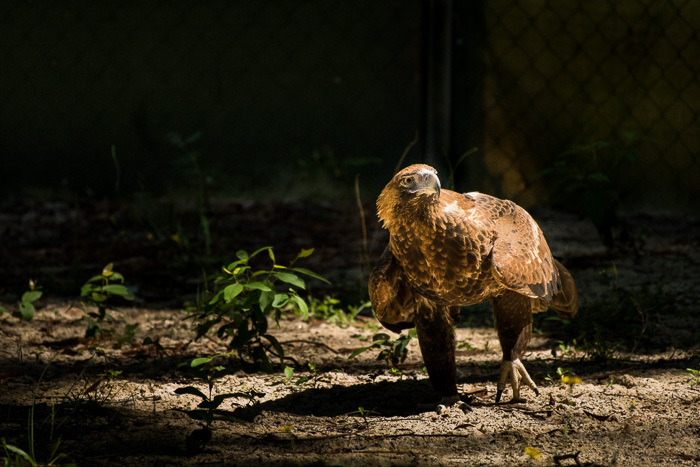 So I shot this when one eagle walked into sunlight and the background remained in shadow. I also darkened it a bit in post. The contrast thus created was so effective that a similar shot was used as the opening spread. There’s not a lot of space in a magazine feature, so one picture often has to tell a big story. 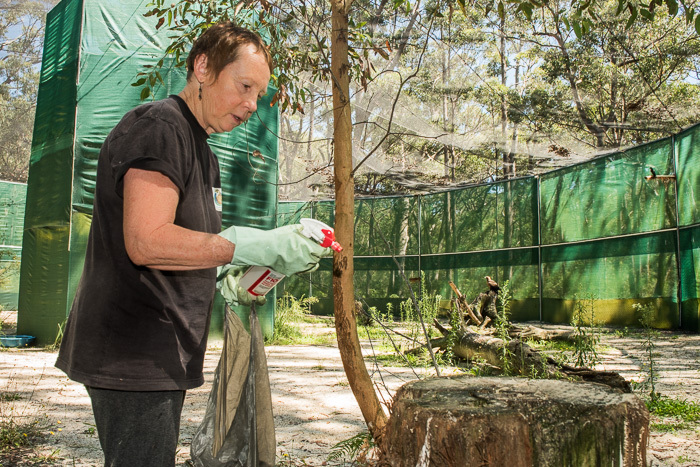 This isn’t the greatest shot, however there is a lot of information in it: the carer, the act of daily cleaning, the round nature of the aviary, the blind in its centre, the visibility of the native forest, plus two raptors, an eagle and a peregrine falcon, in the background. I was so disappointed – in fact, absolutely crushed – when one day I was informed the birds had been released! They had opened the giant aviary doors so that several raptors were allowed to fly out and away. I had so wanted the shot and had been phoning repeatedly for when the release would happen. I had visions of this being my key shot – the one that illustrated the whole story. So what do you photograph instead? I still had a job to do and an assignment to complete. So I shot the empty cage instead. And tried to be as creative as possible with the angles and this shot of a volunteer replacing perches; it has interesting perspective and colour. Thankfully, I was allowed a few extra precious minutes with a raptor which had to remain behind. This wedge-tailed eagle still had no power in his broken wings. But he still made a handsome sight as he sat on a tree stump. It was an opportunity for a nice portrait. It was very late in the evening, about dusk, and the light level was so low I had to use a high ISO of 1600. My latest Nikon, a D810, performed magnificently under such conditions and still gave a very sharp result, even without flash. Oh my gosh, this would have been so impossible in the film days! In a geographic magazine, it’s the relationship of people to the nature or wildlife that is the story. Shots of people in action, doing something interesting, is what brings a story to life. I do a lot of research as to what I plan to capture, but inevitably, it’s some spur of the moment activity that catches my eye and turns into a better shot. When I saw vet and caretaker discussing the progress of recovery of the bird’s wing, I asked them to freeze while I got into a good position and adjusted my lighting. Then I let them get on with it, while I shot lots of frames, varying each slightly. 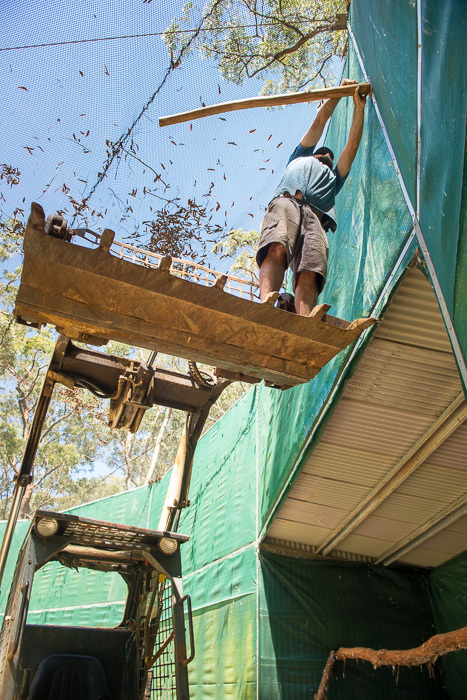 Have a look at the entire feature in the current issue, number 135, of Australian Geographic. This story is on page 64. There is also an online gallery of some extra photos. Do you find these sorts of insights informative? If so, I hope to do more behind-the-scene articles, particularly about my assignments for my important clients.